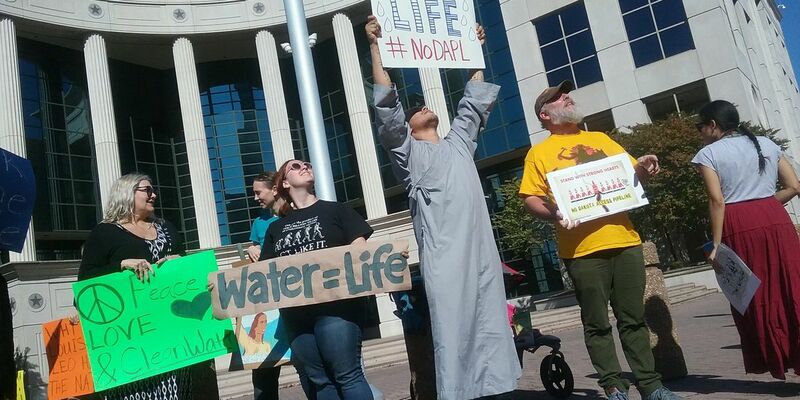 They were joining protesters around the country in what was expected to be the largest demonstrations yet in opposition to the pipeline since the government halted the project in September when construction was delayed by the U.S. Army Corps of Engineers. The corps say construction can't continue without more input from the Standing Rock Sioux tribe. The developer wants to tunnel under the Missouri River to complete the project, but the tribe says it relies on the river for its drinking water and fear the pipeline could cause contamination. Demonstrators say what's happening in North Dakota affects us all. "No matter what nationality creed race whatever you are people can stand together to fight for what's right," said Shawnda Tiger. "There are a lot of people here that care," explained demonstrator Ryan Trundle. "Everything flows downstream. It may not be there right now, but it's coming our way and that water is at risk in there. Our water is at risk and we can't live without water," said organizer Mary Thoma. They're not just protesting the Dakota Pipeline Project. They're protesting the treatment of members of the Standing Rock Sioux Tribe. "They're infringing on the human rights of the Native Americans," said Trundle. "We're asking for the Army Corps of Engineers to protect the Missouri River. We're also asking for a total environmental impact statement and for the Department of Justice to send witnesses to observe some of the human and civil rights violations that are happening there. I actually saw while I was there," explained Thoma. Demonstrators hope people will take the time to learn more about the Dakota Pipeline project and encourage others to get involved. "This is not some other country. This is North Dakota. If it can happen there, it can happen here. I want my children and my grandchildren to be able to drink clean water," said Thoma. In addition to environmental concerns, the tribe has contended that the Dakota Access Pipeline threatens its members' economic well-being, as well as its burial and prayer sites.